In an effort to please everyone, setting expectations and educating your clients is something that creatives often shy away from. But why not create a shiny little brochure to educate your wedding clients? Before shifting to commercial photography full-time, I shot weddings here in Toronto for six or seven years. Perhaps more telling of my style and approach, I was a lawyer at a large international corporate law firm before I shot weddings. Shifting from a corporate world to a creative one, I was shocked at how casually photographers and clients entered into relationships to cover these monumental life-changing events. 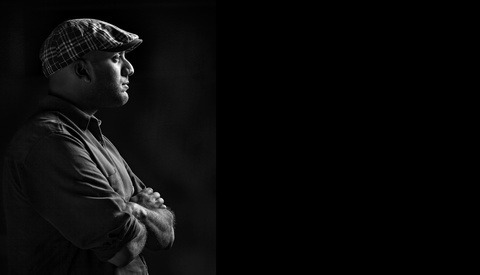 My professional background led me to ensure that there was no mystery on my shoots. As a lawyer, I constantly found that I was educating my clients on complicated areas of law. Given how important wedding-related moments are, I set out to do the same for my couples. One of my main goals as a photographer is to clearly set, and then exceed expectations. Over the years, I figured out that the best way to educate my couples was to create a 'tips' booklet that I shared as soon as we agreed to a wedding package. The most important thing that I shared with my couples was my basic approach to engagement shoots. Although we would have talked about this before I was hired, I felt that it always helped to solidify those expectations. From my perspective, engagement shoots were always a collaboration. It wasn't solely up to me to find the perfect spot, but to work with my couples to find the spot perfect for them. 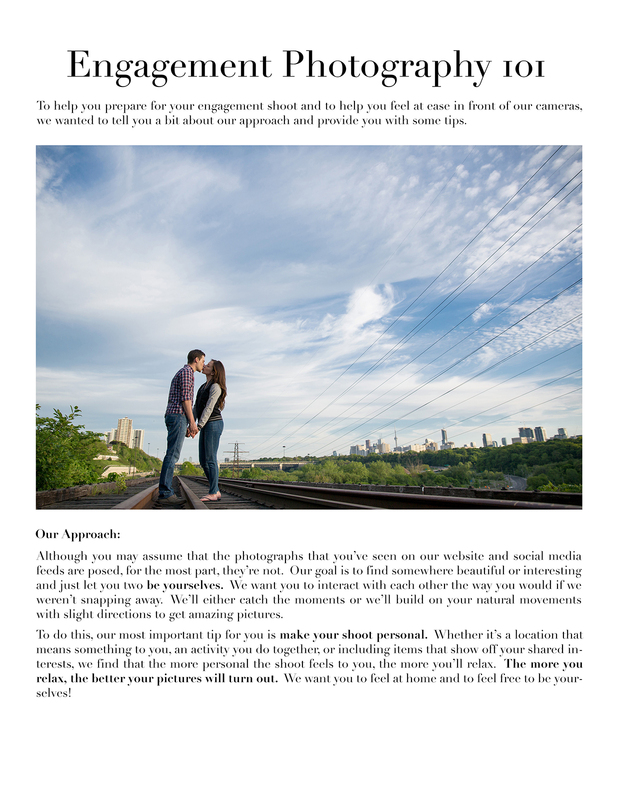 My tips booklet allowed me to explain in detail that the engagement shoot would require a bit effort on my couple's part to get the best pictures possible. Think of it as a chance to educate your couples on how you shoot and how you can achieve success together. Although you may assume that the photographs that you’ve seen on our website and social media feeds are posed, for the most part, they’re not. Our goal is to find somewhere beautiful or interesting and just let you two be yourselves. We want you to interact with each other they way you would if we weren’t snapping away. We’ll either catch the moments or we’ll build on your natural movements with slight directions to get amazing pictures. 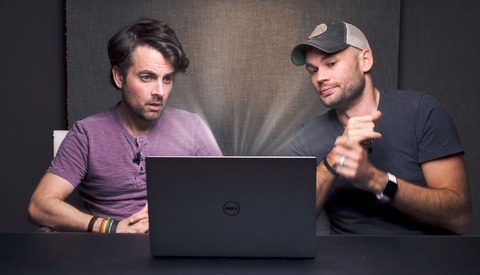 To do this, our most important tip for you is make your shoot personal. Whether it’s a location that means something to you, an activity you do together, or including items that show off your shared interests, we find that the more personal the shoot feels to you, the more you’ll relax. The more you relax, the better your pictures will turn out. We want you to feel at home and to feel free to be yourselves! I was often asked how far in advance engagement shoots should be scheduled. The short answer is that there is no rule for this – it’s mostly about preference. I've had some couples schedule their engagement shoot more than a year before their wedding, others a few weeks beforehand. The only real issue to keep in mind is editing and printing lead times. If my couple was planning on using any of their engagement photos for their wedding, I'd ask them to ensure that we build in enough time for me to edit and assist in printing. For example, if my couples wanted guest books they would be able to look at my booklet to see how long it would take to edit and deliver. I'd also suggest that my couples consider whether they would like their engagement photos taken in a different season from the wedding to provide another look, or whether they would like to schedule the engagement shoot around a seasonal activity or event (e.g., snowboarding, cherry blossoms in High Park, or the CNE). We will put it out there that there are some times of year that are less than ideal for photography. From our perspective, these are winter days without snow, bitterly cold winter days (even if there is snow), and late winter/early spring days when everything is gray and muddy. Unlike your wedding day when we don’t have flexibility, if your scheduled engagement shoot lands on a winter day without snow, an extremely cold winter day, or a rainy day, we suggest rescheduling. A rainy shoot can be very romantic or playful, but it will provide only one look. Likewise, extremely cold winter days with snow can be beautiful and crisp, but these shoots will typically be less comfortable for you and will end earlier because of the freezing conditions. When to shoot also relates to time of day, not just time of year. My preference is to shoot natural light photos in the hours just after sunrise and just before sunset. I'd also suggest that my couples consider when there will be the fewest people in their chosen location – for example, it's better to shoot in popular parks at sunrise rather than sunset for tranquil, romantic images. Of course, this would be different if the couple wanted to go to the CNE or record shopping for their shoot, where people may add to, not detract from, the atmosphere. Ultimately, most of my couples were not morning people and opted to schedule their shoot for before sunset. Depending on the weather (including whether it’s a clear or overcast day), I'd suggest starting two to four hours before sunset. This way, I could get in about 90 minutes of photography during the best light of the day. Not only would this help my couples think about locations and timing, it would explain the timeline for the shoot — setting out a 90 minute expectation and raising the idea that the start time would be a soft time that would be dependent on the weather. 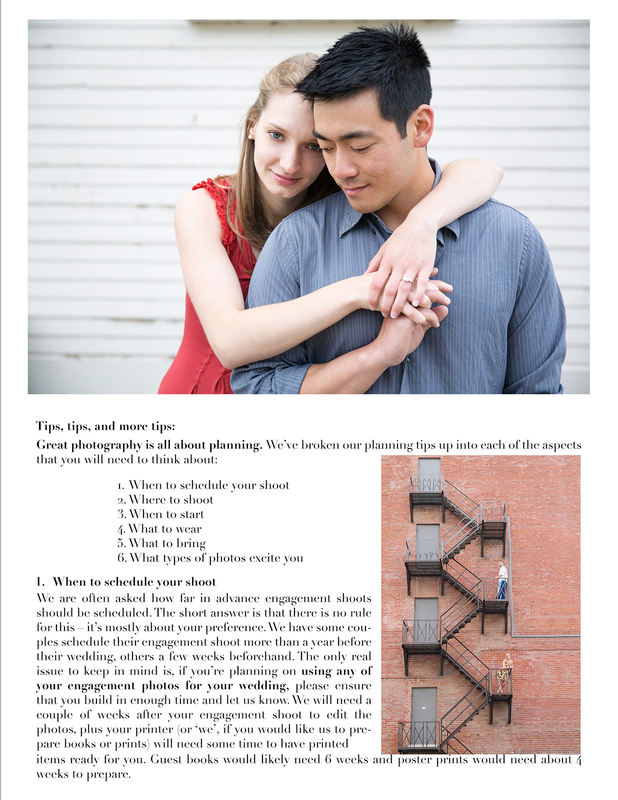 Part II will focus on the where's and what's of an engagement shoot prep booklet. I'd love to hear or see what sort of materials you share with your couples. He's a former lawyer and the first shot shown of his tips, has his couple on a railway line???!!?!? That particular railway line has been decommissioned and no longer in use. Thanks Nick, yes, that line hasn't been in use for as long as I can remember. Just behind me as I took the shot were weeds about 12 feet tall and a train block. There is another train block about 500 metres back from the last one. Would never put a couple at risk like that.